This Japanese zodiac calculator with help you predict your personality as well as that of others. Simply, by your birth date you can discover what your Japanese zodiac sign is. You will get a report of your unique horoscope that analyzes your personality. The Japanese zodiac is actually based upon the Chinese calendar that goes by the phases of the moon. This Japanese Zodiac Signs Calculator is valid from 1936 to 2020. So if you are wondering what kind of personality your future baby will have in the year 2017 or up to 2020, you may receive an interpretation by that birth date. All you need to know is that future date and use the calculator to obtain a report. 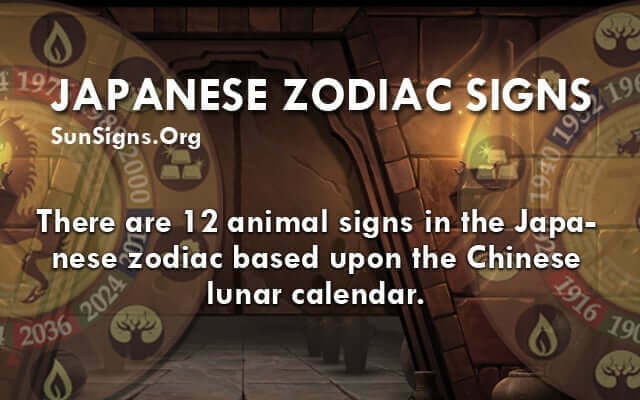 The twelve animal signs of the Japanese zodiac that are based on different birth dates are: Nezumi, Ushi, Tora, Usagi, Tatsu, Hebi, Uma, Hitsuji, Saru, Tori, Inu & Inoshishi. The Japanese Zodiac will give you an extensive report. You will learn the good and bad characteristics of your animal sign, what your lucky colors are, the months and seasons best suited for you, your gemstone that represents you, what your element is. It also shows if your energy is Yin or Yang, the planet that rules you and the western astrology zodiac sign that is equivalent to your Japanese animal sign. With this report you will be given much insight as to what your strengths and weaknesses are. With this knowledge you have a more logical way of being able to change or develop your best qualities. It is known that people born in particular years are destined to take on the qualities of that particular Japanese zodiac animal sign. Find out what your Japanese zodiac sign is with this easy calculator and you will know yourself that much more.